NOW: In the spring of 1931 the last attraction at Luna Park, its natatorium, was torched by an arsonist. Later the pool’s sturdy tank was used in the construction of the small park that reaches with fill 100 feet beyond the shoreline. At the lowest tides some of the piles of Luna Park are exposed. Extending over the tideflats below Duwamish Head it could be seen from almost everywhere. The lolling tidelands off the Head were too shallow for ships but not this sprawling boardwalk raised on piles for amusements. 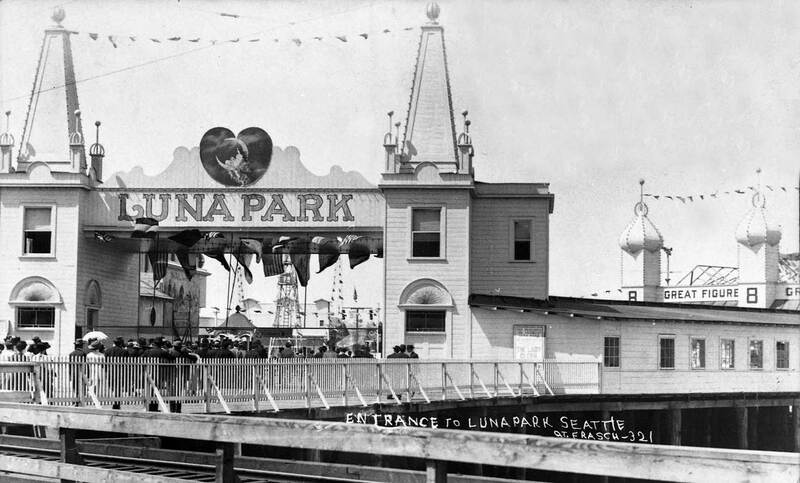 Once the two tardy boilers were installed in its own power plant, Luna Park was its own billboard, shining across Elliot Bay and up and down Puget Sound. 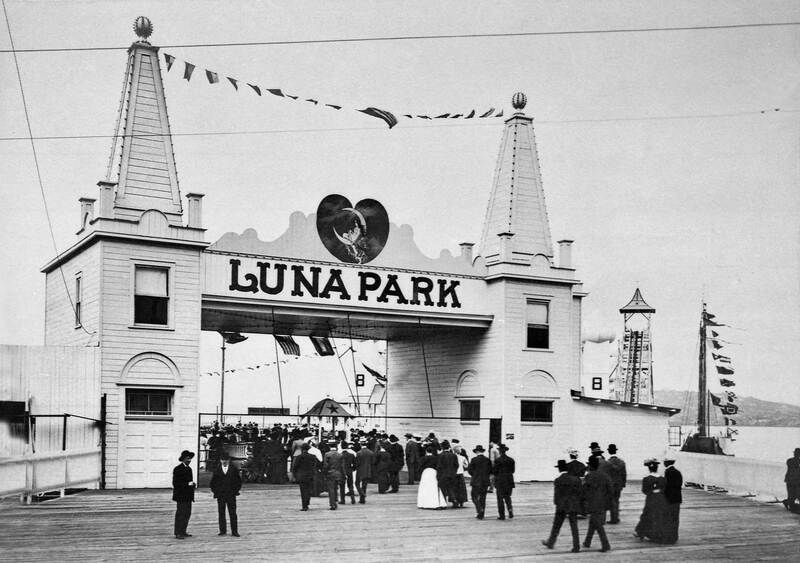 The busiest issue during the amusement’s construction was whether or not the West Seattle City Council was correct to give Luna Park a liquor license. The developers had promised that the sale of intoxicants would be conducted properly. This propriety ran out with bad news. 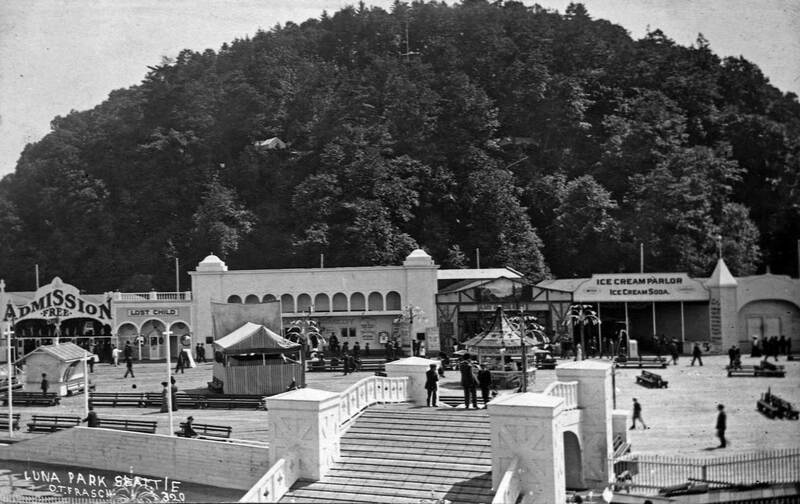 For instance, a Post-Intelligencer reporter riding a packed trolley to town after a Sunday Night Dance at the park, noted “The boisterous conduct and the indecent language of the joy-dancers disgusted the respectable patrons of the line.” Except for its cleanest amusement, the natatorium, Luna Park was closed in 1913. Anything to add, Paul? Oh a few things Jean, and sticking close to Duwamish Head too – with the exception of something on Sea View Hall. This may be the earliest intimate birdseye of the West Seattle harbor. I have grabbed 1890 as it’s date on the evidence of a sketch that appeared in the “Graphic,” a Chicago-based publication that this year included a fulsome article comparing West Seattle to the best that Switzerland had to offer in the way of sublimity. 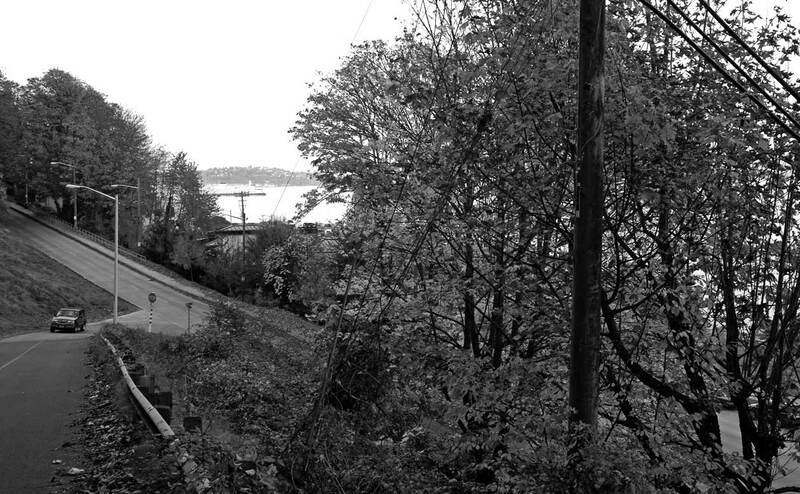 The Graphic’s line drawing of the harbor is in every detail the same as this photograph although it was copied from another photograph taken almost certainly within moments of this one a few feet further southeast on what was then the clear cut and exposed Duwamish Head. The ferry “City of Seattle,” far right, is moving (it is streaked) into its slip after a run from the Seattle Waterfront. 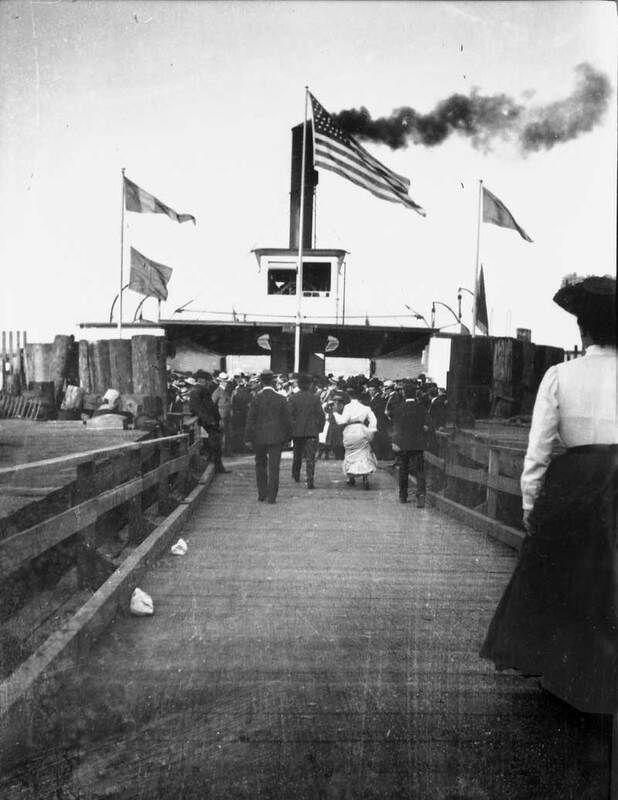 The inaugural trip was made on Dec. 24, 1888. 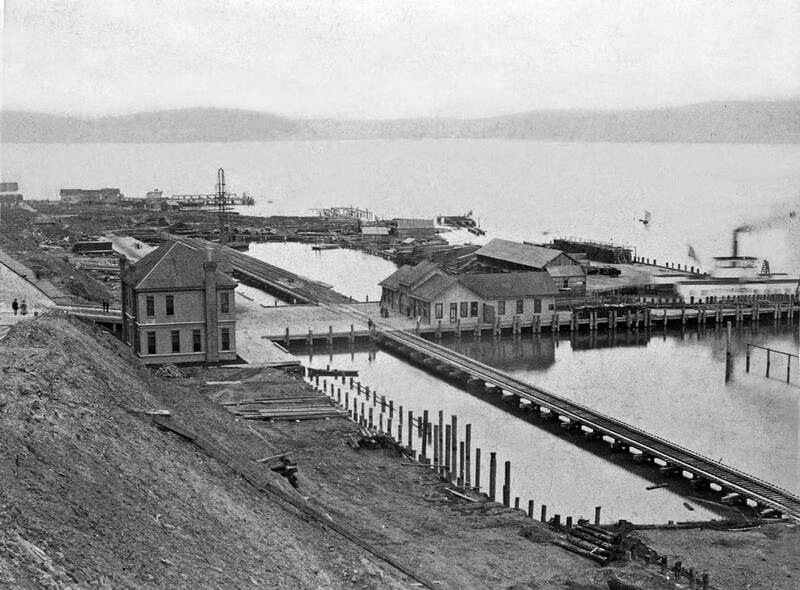 The long Northern Pacific spur that runs through the scene between the ferry and the waterfront was completed in August of 1890. And the two-mile-long cable railway that looped up Ferry Street to the West Seattle addition atop the ridge and back down California Way Southwest to the developer’s headquarters, the big boxish building far left, was formally opened on Sept 6, 1890 with much hoopla. California Way and Ferry Street meet on the far left of the ca. 1890 view. Neither can tracks be seen running near the center of those streets nor can we be certain that they are not. Like the N.P. spur from Seattle these cable railway tracks were also laid during the summer of 1890. These recurring questions of why and how to go to West Seattle were ones David Denny probably asked himself many times as he waited for his brother Arthur to find him at Alki Point. David had preceded the “Denny Party” to scout for a settlement on Puget Sound. The Denny Party finally arrived on a wet Nov. 13, 1851. But many others claimed Seattle “began” in mid-September, 1851, when the area’s first settlers, including Henry Van Asselt and Luther Collins, staked claims on the Duwamish River in South Seattle, not West. Others objected that the city was more properly “founded” in 1852 when the Dennys and others abandoned Alki Point and marked new claims on the protected east shore of Elliott Bay. 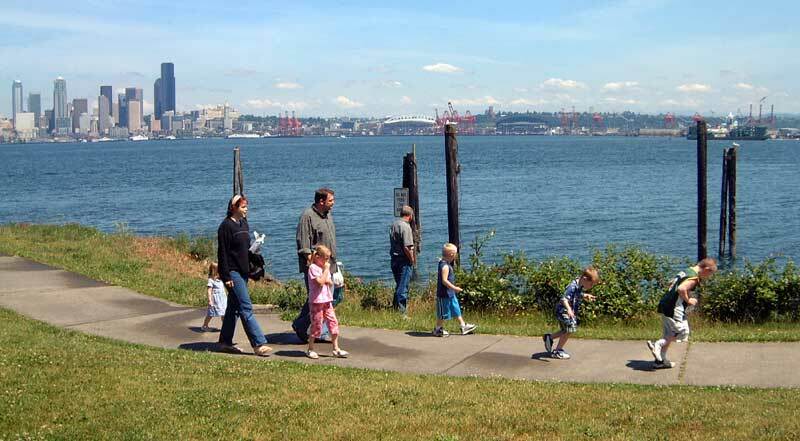 From this Seattle site, Alki Point was hidden behind what the Indians called Sqwudux and the settlers called Lamb’s Point. Today we call it Duwamish Head. City of Seattle Ferry, far right, beside its Marion Street slip. Milton was first called West Seattle in the late 1880s when the questions of why and how to get there were first seriously answered by the West” Seattle Land and Improvement Company. 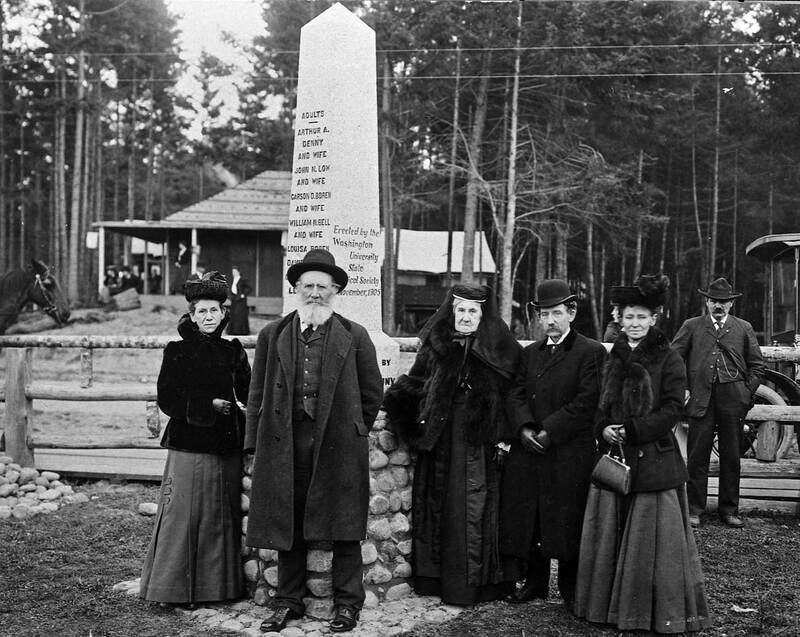 This group of San Francisco capitalists bought a lot of land up on the bluff for marking and selling view lots; encouraged development along the waterfront with a yacht club, shipyard, boathouse and first regular ferry service from Seattle on the City of Seattle; and started the area’s first community newspaper. And the news spread. The gangplank on the West Seattle Harbor Ave. side. Still, not enough buyers were moved. So the improvement company built a cablecar line that looped through 14 curves (the most, it was claimed, for any cable system) from the ferry dock to the top of the bluff and back. However, it ran only when the ferry arrived, and although Seattle was expanding, it was in other directions. In 1898 the capitalists abandoned their cablecars, and the few buyers they had attracted had to walk to their homes at the top of the bluff. Ferry City of Seattle, center-left, at its Marion Street slip. 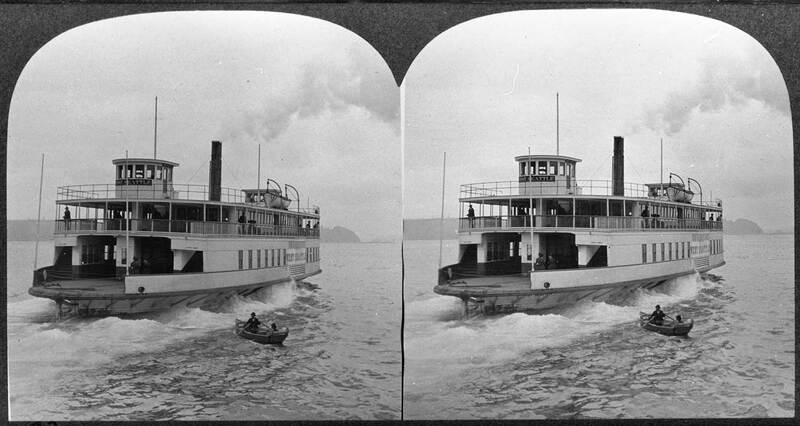 On the right is the Tourist, out of Port Townsend, and on the left the Flyer, perhaps the most popular steamer in the history of the "Mosquito Fleet." 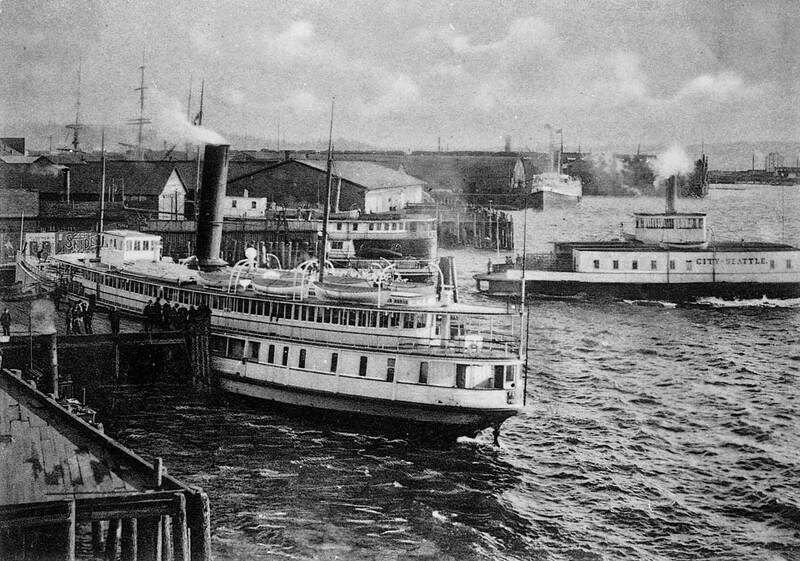 The Flyer's speedy packet was between Seattle and Tacoma, and it held on long after the railroads has spoiled other water routes with obsolescence. Our historical view – at the top – of the City of Seattle landing and unloading ferry passengers at the West Seattle slip dates from about 1902, the year West Seattle first incorporated its 16 square miles. The new town also bought and converted the unused cable to an electric line, and proudly claimed it the first municipally owned common carrier in the country. 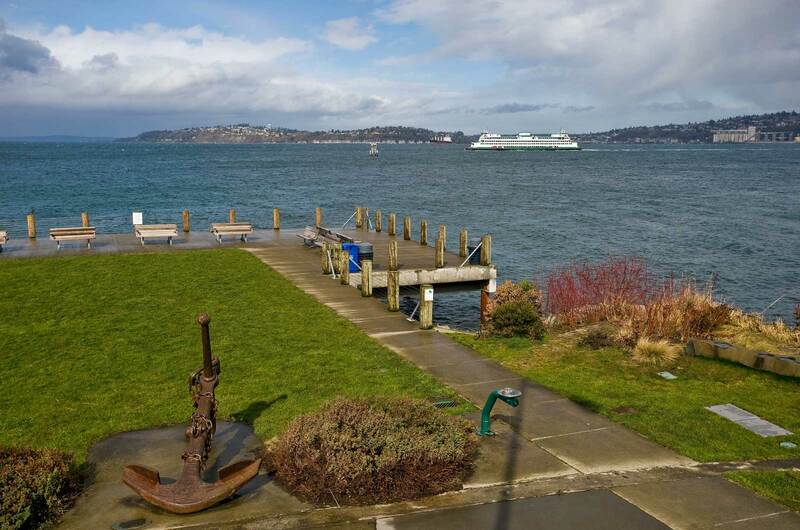 West Seattle was still a small bedroom community for Seattle – most of the city council’s work was done on the ferry – but the boom was coming. It arrived in 1907. The 1,200 citizens voted overwhelmingly for annexation to Seattle, because they were “plainly designated by nature to form one community.” The two were now also linked by the West Seattle, a bigger and faster ferry. However, the most encouraging connection was at last by land, or rather by trestle, along Spokane Street. 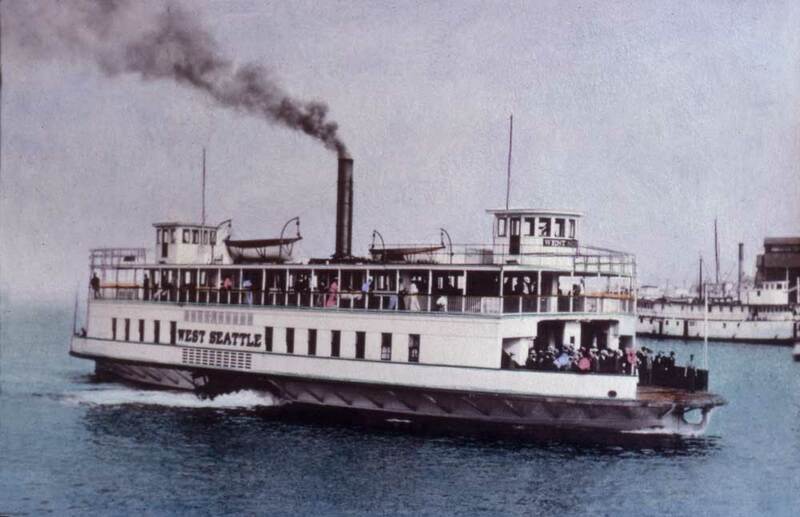 Ferry West Seattle, hand-colored by Robert Bradley. West Seattle now offered in 1907 the modem suburban dream where one could, the promoters claimed, “fully enjoy the quiet of rural life, combined with the comforts and convenience of the city, and feast on the soul-inspiring scenic charms which in matchless grandeur surround one on every side.” In 1907, at last, the bedroom community was adding a living room and raising a neighborhood – actually several of them – and answers to the questions why and how to get to West Seattle seemed self evident. When in the mid-l960s West Seattle’s density became higher than the citywide average, the old questions returned with a congested alarm. The living room had been converted into an apartment and “where two once lived now eighty do.” Although they were not building 747s in West Seattle, the multi-unit construction reached its peak with the Boeing Boom. 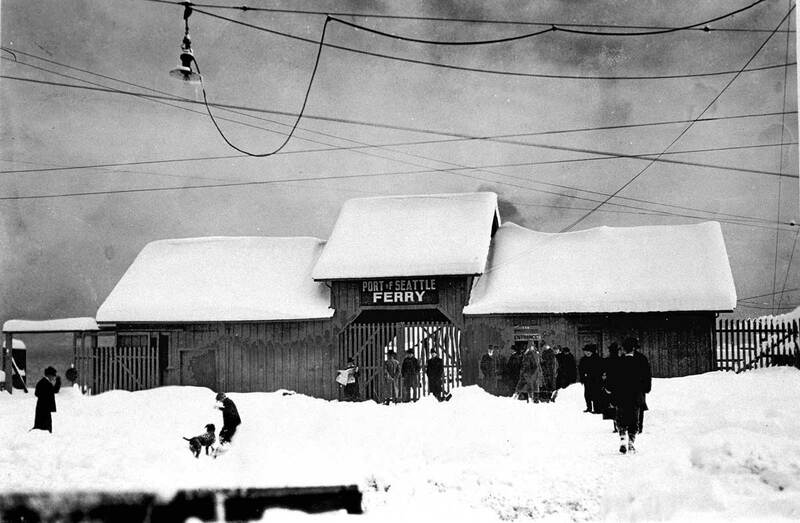 West Seattle ferry terminal during the 1916 Big Snow. Near the West Seattle site where the West Seattle ferry once landed. 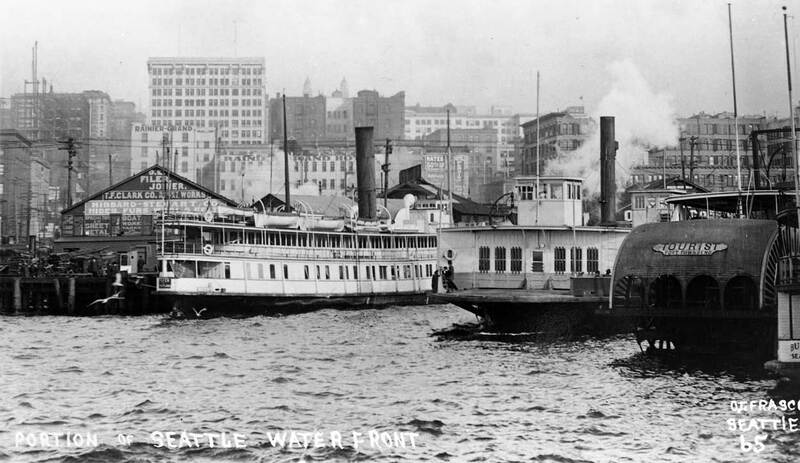 On June 27, 1907, the new and larger ferry West Seattle took the place of Puget Sound’s first ferry, the City of Seattle, for the short hauls across Elliott Bay between the Seattle and West Seattle waterfronts. This was one of several developments that summer that drew these neighborhoods together. Yet it was the opening of trolley service to West Seattle over the Spokane Street bridge that would steal away the new ferry’s passengers and dissipate the commercial joy of its first summer. 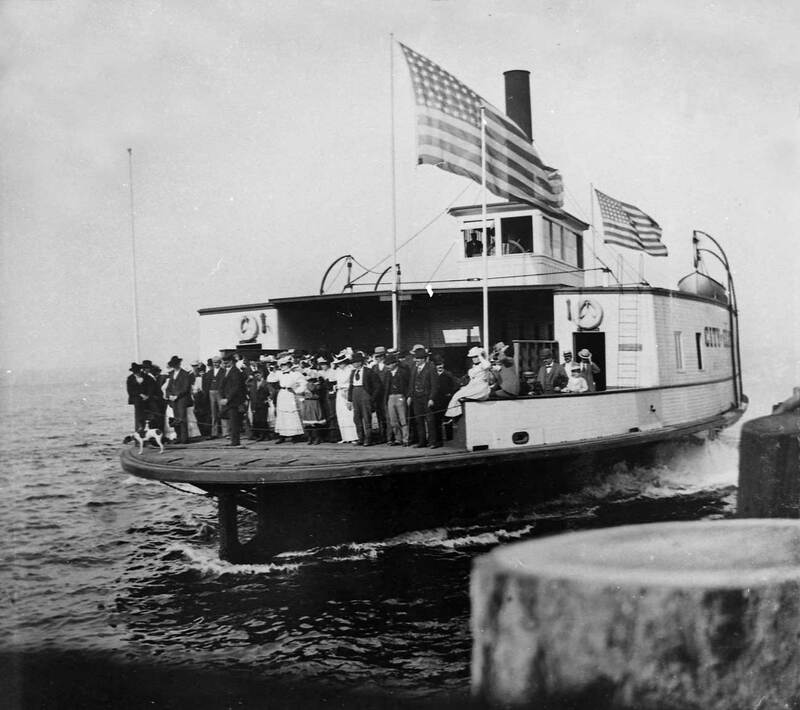 Purchased by the Port of Seattle in 1913, the West Seattle ferry continued to lose money. 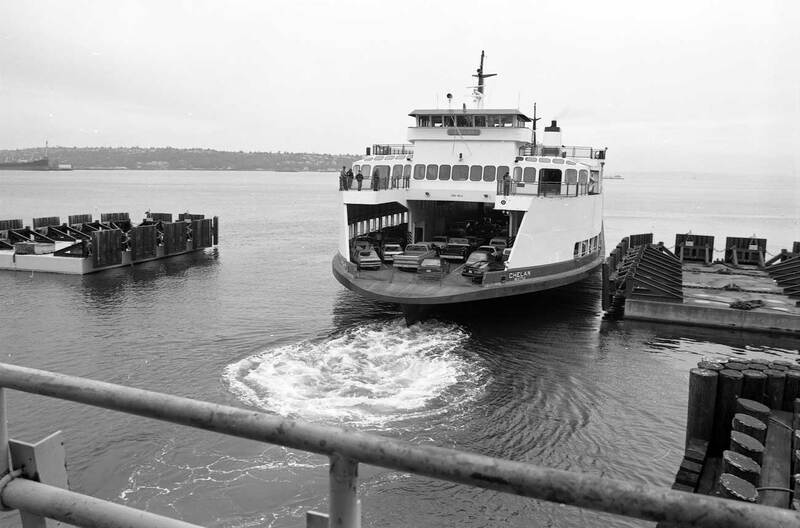 Eventually it was given to King County, which leased it to the Kitsap County Transportation Company as a relief ferry on its Vashon Heights run. This scene is part of a stereograph photographed by Capitol Hill resident Frank Harwood in 1908 or ’09. Its other endearing quality is the confrontation between the prop wash of the ferry as it leaves its slip at Marion Street and the audacious rowboat heading into it. At 328 feet, the modern-day ferry Chelan is more than twice the length of the 145-foot West Seattle. (The Chelan appears in the Pacific feature for June 16, 1996, but like much else has since been squirreled in some corner of the basement studio where I do something similar to work.) 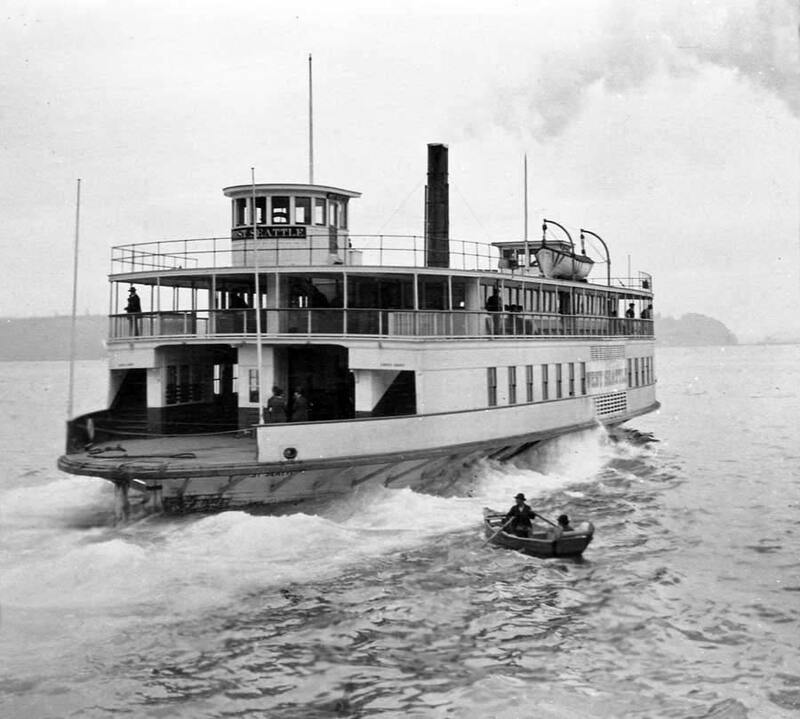 One of the “Issaquah class” ferries constructed for the state in the early 1980s, the Chelan and its five sisters were plagued by glitches in their innovative computer controls. Since their overhaul in the late ’80s, however, the Chelan and the rest have been the reliable mainstays of the system. Smaller than either the jumbo or super ferries, they are able, with the help of variable-pitch props, to quickly pull in, unload, reload and pull out. 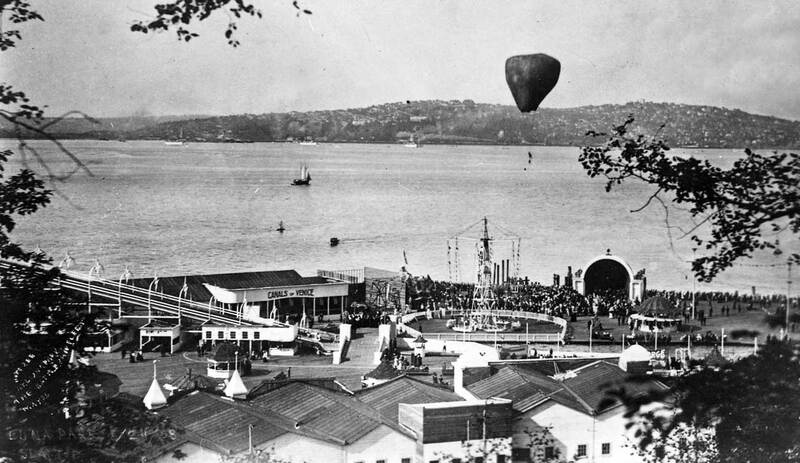 If there is truth in this naming, then the prospect of Puget Sound from Sea View Hall was most likely unobstructed when the hall was built early in the 1900s. Now that view is somewhat obscured by beachside homes and the hall’s own front-yard landscape. Sea View Hall is one of three log-cabin survivors in the Alki Point neighborhood. (The others are the Log Cabin Museum and the now closed and threatened Homestead Restaurant.) Like the better-known but since lost Stockade Hotel, the hall was constructed in good part of wood salvaged from the beach, its logs set vertically like a fort. “Sea View Hall” was eventually spelled out in “logoglyph” style; letters shaped with big sticks and hung from the roof, or in this case the upper veranda. In this early view, the sign has not yet been shaped or placed. John and Ella Maurer are probably among the at least 23 persons posing here. In 1954, the hall’s 50th anniversary, John was identified as its builder by his daughter-in-law. 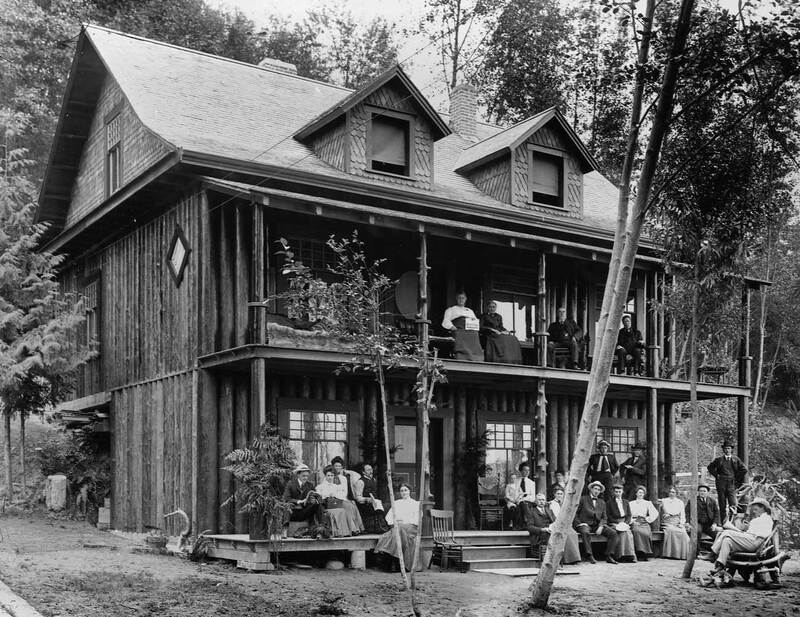 After returning from the Alaska Gold Rush, he took up construction and painting, and built this nostalgic summer cabin for his family’s recreational retreat from Seattle. The rustic theme was continued inside with, for instance, a staircase handrail constructed from a peeled log with banister supports fashioned from the same log’s twisted branches. 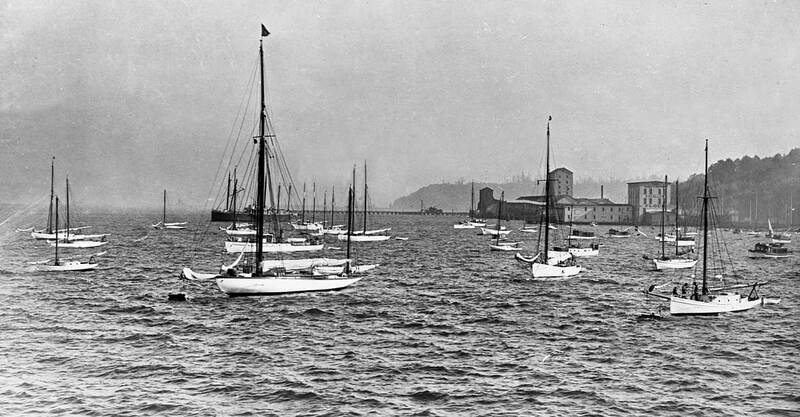 West Seattle’s waterfront was once an energetic mix of shipbuilders, fish packers and yachtsmen. This beach scene, photographed a short distance south of the Duwamish Head, features all three and a few houseboats besides. 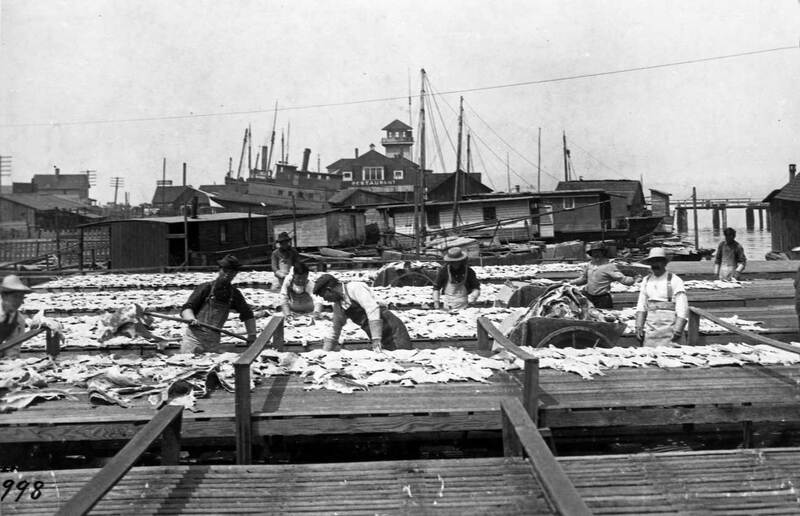 In 1913, 70 percent of the world’s halibut catch was shipped through Seattle, briefly the halibut capital of the world. Here a few of these flat fish have found their way to sorting tables. The proprietors may be Thomas King and Albert Winge, who – in addition to running cod and halibut fleets out of West Seattle – built and repaired ships at their yard here at Duwamish Head. The proud partners were so pleased by their rhyming moniker that they christened one of their halibut boats the King and Winge and another the Tom and Al. The vessel at the bottom of the scene is, most likely, connected with some King and Winge at Duwamish Head. The King and Winge firm is most likely responsible for the two beached ships at the left of the scene’s center. The partners, who joined in 1901, repaired tugs, barges and ferries, and in a quarter-century built or aided in the construction of nearly 500 vessels. 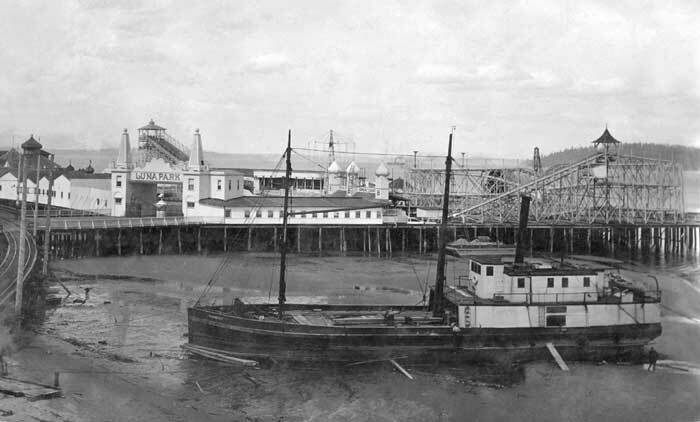 The towered structure at the center of this (top) scene was built in the early 1890s as quarters for a yacht club – a predecessor to the Seattle Yacht Club. However, the combination of northerly winds, ships’ wakes and remote quarters drove most of the membership back to the Seattle waterfront by the end of the decade. 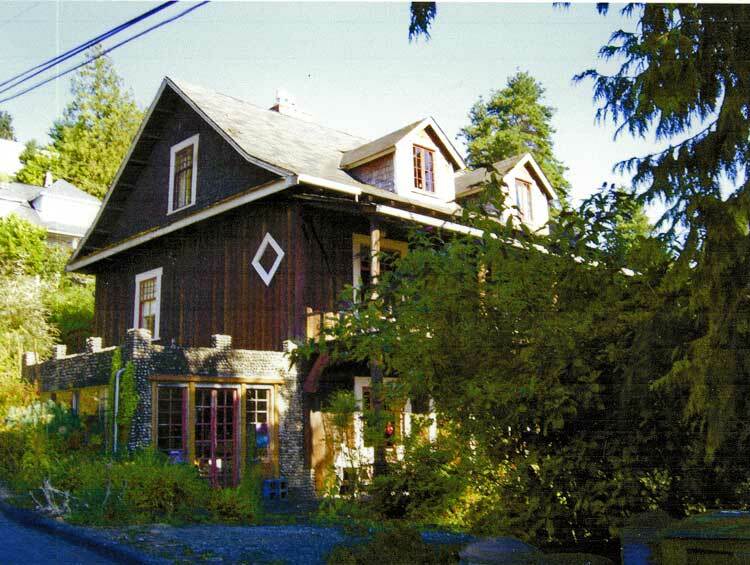 In this early century view, the yachtsmen’s abandoned quarters house a restaurant that surely had halibut on its menu. Beginning in the summer of 1890 it was possible to pass between Seattle and West Seattle without the ferry. Nonetheless, the trek over the Seattle Terminal Railway’s trestle above the Elliott Bay tide flats was a long one, and missing the last ferry to West Seattle at 7 in the evening was a mistake clearly to be avoided. The historical scene was photographed from near the West Seattle end of that trestle probably soon after it was completed in 1890. 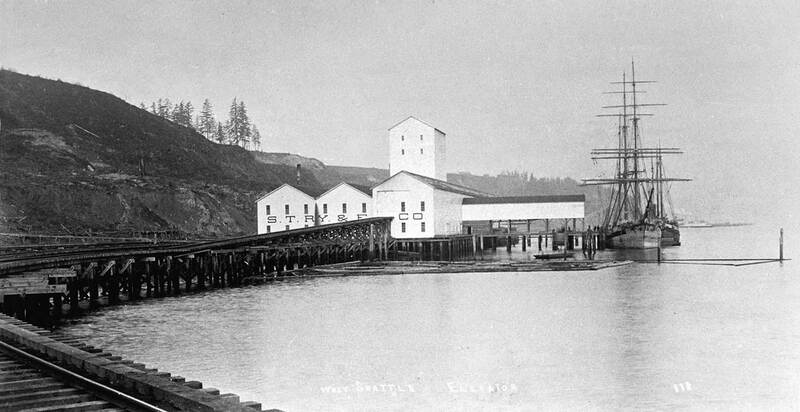 The photographer’s subject, the Seattle Terminal Railway & Elevator Co.’s grain elevator, was believed to be the first of a system of wharves that would crowd around Duwamish Head. In the year before this (top) view was recorded, the West Seattle heights were cleared of their second-growth timber, leaving the largely barren ridge showing on the left. Ewing built a cable railway to carry his customers up the hill for an inspection of the denuded view lots. The cable line, subdivision and grain elevator were all laid out by an engineer named Richard H. Stretch. Novelty Mill appears right-of-center, with Seattle Yacht Club vessels restrained in still open waters of the east shore of West Seattle. 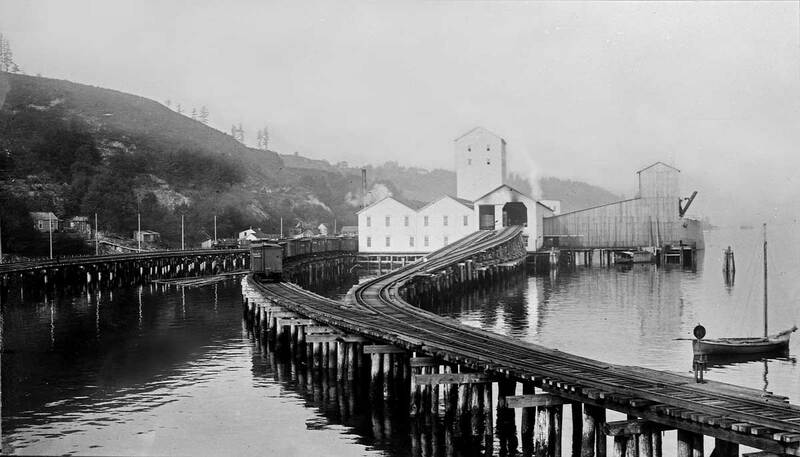 The Southern Pacific and the string of wharves never made it to West Seattle’s harbor, but the mill lived on for many years, after 1893 known as the Novelty Mill. Ninety-nine years later a few of its original 1900 piles support Salty’s Restaurant. 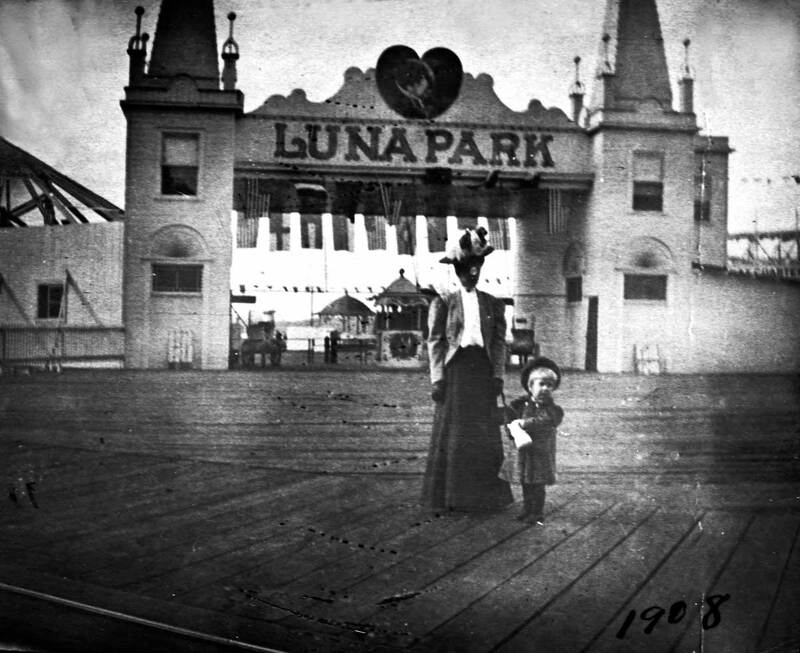 Described by its builders as “the greatest outdoor amusement in the Pacific Northwest, Luna Park opened in 1907 below West Seattle’s Duwamish.Head, where its twelve acre timber pile platform above the tides lured Seattle to its attractions. The park could be easily seen across Elliott Bay, especially after sunset with its 2000 electric bulbs. Getting there was easy both by ferry and by electric trolley, which began running to West Seattle the same year, across an early Spokane Avenue swing bridge. The only Luna Park amusement that survived this zeal was the good clean but cold fun of the saltwater natatorium, which stayed open until 1931, when it ended its years with its only instance of heated water. The pool was destroyed by an arsonist. 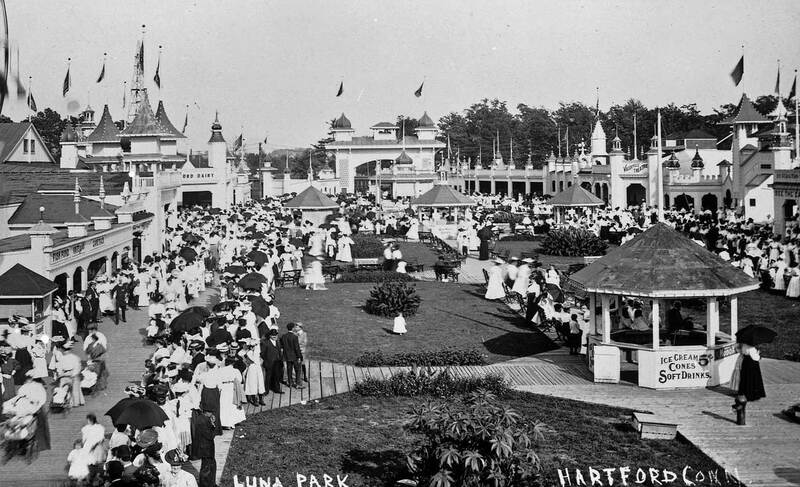 Another Luna Park - in Hartford. Is the location of the old Novelty mill, and currently Salty’s, the same location. Are the beams in Saltys, a part of the old mill?